Check Out The Nerd Block Jr Box Kaylyn Got!!! Nerd Block sent me a Nerd Block Jr Box for girls for free to try out and share our thoughts on the box! I picked the Nerd Block Jr, for Girls to give to my niece Kaylyn! When I went over to give her the box, she was so excited to open it and see what fun goodies were inside. She got a Hello Kitty egg, with a pencil topper inside, Snow White and Grumpy, Despicable Me book mark, Polly Pocket, and the Crayola EZ-3D Coloring set. She was so excited to play with the toys and color! I have to say, this Nerd Block Jr. for Girls box was pretty awesome! It has some really fun items! I am not a kid, and I was thinking I wanted to play with it all! 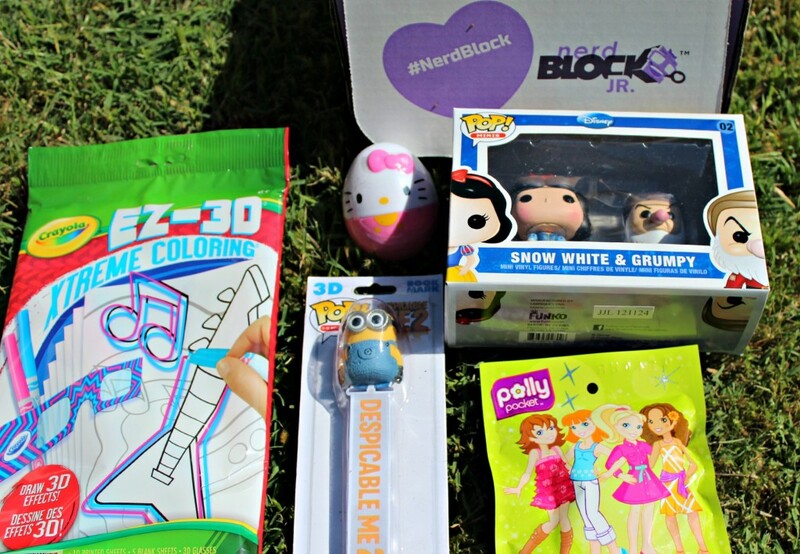 If you have never heard of Nerd Block and Nerd Block Jr, it is a fun subscription box that they will send with some really fun nerd friendly hand-picked goodies. Their motto is, “Geek Tested, Nerd Approved”. They have different boxes to choose from depending on age, and such. I chose the girl one for my niece. It is really neat because Nerd Block spends hours testing and trying out products for their fun factor. Then they pick out items and put a few in a box, so each month you will have new items to enjoy! This is a picture of all the goodies that came in the box. 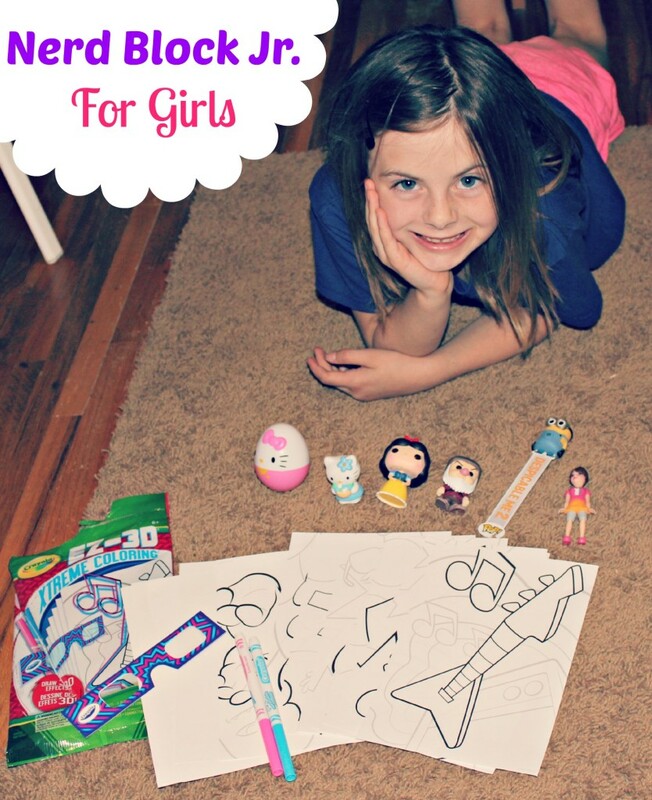 Lots of fun goodies that Kaylyn is loving!!! Head over to Nerd Block and check out their site! For a girl or boy Nerd Block Jr, it is just $13.99 a month. This would be a fun gift to send, or to treat your kid to some fun toys and activities! They do have adult boxes if you are jealous and want some fun items too! Wow, there was so much cool stuff in there!! I love that Snow White & Grumpy! My son is obsessed with Nerd Blocks! They always have the coolest surprises. I don’t know how they do it! How fun is this? My girls would love something like this. I see lots of things they’re already into here! A great gift idea! What a neat idea! I love the Hello Kitty! This is such a cute idea esp for the summertime! Okay this is a really cute subscription box! What kid wouldn’t love that! This looks like so much fun for my youngest niece, I like that it’s a gift she will get each month. That is an awesome set! My daughter would love it and so would my older nieces! What a fun set for girls. This is an awesome subscription box! 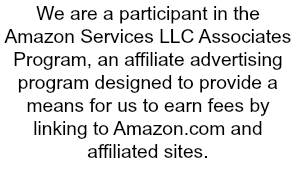 And for only $13.99 a month, the price is great too. This looks like it would be a lot of fun for my daughter! She would love finding out what was in it each month. this looks like something my daughter would adore! I would love to get a box. How neat! I’ll have to go check it out for my oldest. Looks like a lot of fun, especially during summer break. This would be a great box to get each month, especially for those summer road trips! Those look like a ton of fun! What a great gift idea as well! This is just too adorable! I love this idea! I bet my nephew would be all over it. That seems like a really cool box. I know my kids would love them. What a great box of goodies. I am sure the children loved them. I love how creative these subscription boxes are. There’s some neat stuff in there. Hello Kitty is not nerdy! I remember how much fun it was to receive something in the mail as a child. This is a great idea and nerdy is clearly fun! Wow, I a, seriously considering getting one for my girls! They are so fun and exciting! what a cute assortment, my daughter would enjoy all of these items! That looks like a lot of fun! I would have loved something like this when I was a kid! I used to play Polly Pocket with my sister when we were younger. What a fun assortment! My daughter would enjoy this. Such fun things! My kids (ages 9 and 7) would love these! I need to make some fun baskets to keep around the house this summer for entertainment for the kids!